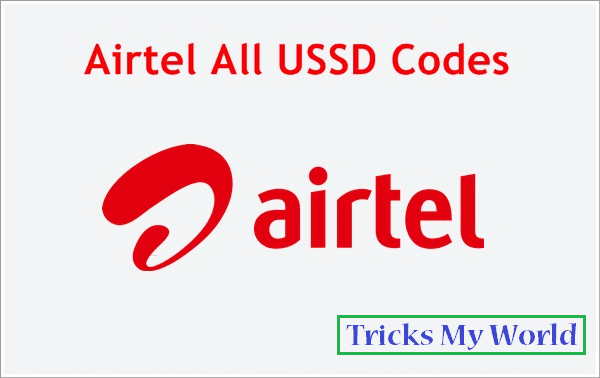 Airtel USSD Codes Lists , Airtel balance check code / number , Airtel 3G 4G balance check , how to check airtel number. Airtel is one of the most popular telecom company in the world. Airtel has many USSD Codes to check Main Balance, SMS Balance, 2G, 3G and 4G Balance, Free Minutes, Check Mobile Number, Offers, and Alerts etc. So it's very difficult to remember all Airtel USSD Codes. If you are using Airtel network then this article very useful to you because in this post I am giving Airtel USSD Codes lists to Check many Airtel services. Simply dial following Airtel USSD Codes from your mobile to check balance , GPRS pack, SMS pack, and more Airtel services. Here I am giving Prepaid Airtel all USSD Codes to check main balance, sms ,2g and 3g balance, offers and alerts etc. Now you can check and activate which you want Airtel services using below USSD Codes. If you want to check any Airtel services balance, you can use below Airtel USSD Codes. For example, want to check your airtel main balance then simply dial airtel balance check USSD Code *123#. If you have any problem or any other airtel services or balance detection then you can call Airtel customer care number they will solve your problem. NOTE : All USSD Codes tested and working fine in my State. If in your state work fine this USSD Codes then please comment below with your State to help other visitors.